All you need for this project are stones and a touch-up pen suitable for porouse surfaces. The stones need to be large enough to fit the names of whatever you've planted. I just scribbled the names of my herbs onto the stones and added some kind of decorative border. Stones are waterproof (duh), the pen is too, so they'll last forever. Number two: polymer clay markers! I used white polymer clay - every color you like will work - and punch letters. If you don't have punch letters, you could also use a touch-up pen, a sharpie, really any kind of waterproof pen would work. I rolled the polymer clay down to a thickness of about 4 mm (0.15 inch), and then cut stripes. I cut the endings diagonally so the markers would ease into the soil. Next I baked the polymer clay according to the instructions to harden it. This is the simplest one yet. Eat popsicles (or buy the sticks at a craft store like I did), use a sharpie or any waterproof pen, or even a ballpoint pen to inscribe the sticks, plant in soil, done! 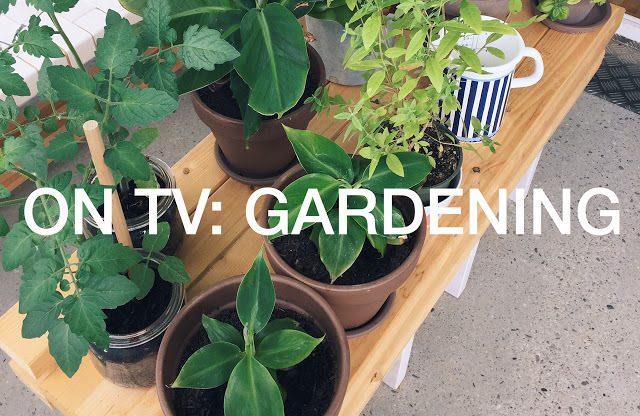 See, three simple and inexpensive ways to mark your plants. I hope you like them! Happy Monday, and yes I meant that!